El Yankee Stadium es el parque donde juegan como locales los New York Yankees, pertenecientes a las Grandes Ligas de Béisbol de América del Norte. Inaugurado en 2009, suplantó al estadio del mismo nombre que funcionó en el período 1923-2008, y estaba anexo al actual estadio en su parte sur. Tiene capacidad para 50.291 espectadores, el tercero más grande de las Grandes Ligas. En términos generales, el Yankee Stadium posee características que evocan al antiguo parque de béisbol,​ aunque un 63 por ciento más grande​ más varias incorporaciones modernas. Es el inmueble más caro jamás construido en la historia del béisbol;​ y el segundo recinto deportivo, a nivel mundial, detrás del Estadio de Wembley.​ Otras secciones del estadio incluyen el Monument Park, localizado atrás del jardín central y sitio dedicado a la memoria de los mejores jugadores del club; el New York Yankees Museum, colección de objetos relativos a la historia de los Yankees y al béisbol; y el Great Hall, amplio espacio que aloja diversas tiendas y restaurantes. El boleto más caro, para ver un partido, se avaluó en 2.625 dólares. De hecho, el promedio del precio de una entrada para un juego de apertura de temporada, era el más alto de las mayores, llegando a los US$ 72,97.​del 2009 a 2017. Loved the family atmosphere of this great American tradition. It was our first baseball match and we were not disappointed!! We were even treated to a choreographed performance of YMCA by the men smoothing out the sand on the field at one point! There are good facilities to eat and drink etc and vendors walking around selling snacks during the game. If it's your first game you can also go to the office and get a named "first game certificate" as a souvenir! Excellent night out!! 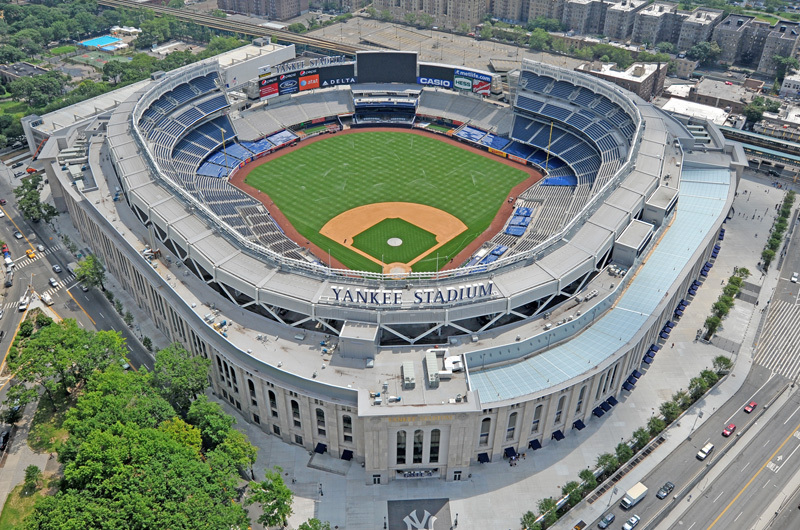 Great stadium, a landmark of New York that everyone should visit. Very well connected to Manhattan with multiple subway lines. There are plenty of sports bars around it, suggest to have a beer there and some food before heading in. Currently used by the football team ('soccer' on this side of the Atlantic) New York City Football Club as well as the classic Yankees. Easy access to the building, comfortable seats and good view from everywhere. Drinks and food are expensive though! Better to have food on the bars outside and only drinks inside. Queues can be long too. Enjoy the experience! I miss the old Yankee Stadium. After nearly a decade, I've never really warmed up to this ballpark. It's a little lacking in warmth. Though I am a die-hard New York Yankee fan, I still prefer the ballparks like Philadelphia and Baltimore which are homey and intimate. You certainly do not get that feeling at Yankee Stadium. Fortunately the organization is classy and the team they put on the field is a fine product! Let's go Yankees!! Best experience ever!! Our dream come true!! My son and I made the trip from Hickory, North Carolina!!! We had an AWESOME experience. We even took the train that stopped right at the stadium. What a great time I enjoyed with my son! The Yankees museum was awesome as well. That's another check off of my bucket list!! Go! It's a shrine to the NY Yankees and baseball altogether. The place is well kept and the staff are awesomely nice and helpful. Everybody was smiling and courteous. Leave yourself time, pregame of course, to walk and discover fun areas, museums and monument park. Great place to take in a game! Enjoy! I'll be back, soon hopefully.